Exclusively targeting female consumers with new “feminine” brands and expressions would be an “embarrassing” mistake for the whisky industry, experts have argued in a recent debate. During The Worshipful Company of Distillers’ City Debate 2015, held in London yesterday (14 May), a panel of leading spirits industry figures was asked whether whisky producers are targeting the female market through innovation. Damien Heary, global innovation and planning director at William Grant & Sons, said that to specifically target women with new brands or brand extensions would be a “mistake” because companies were at risk of producing products that are “pink and embarrassing”. “It’s a marketing challenge rather than just being about the liquid, but companies need to avoid being patronising,” he said. Spirits writer and consultant Ian Buxton concurred, adding that the industry will evolve to include a greater female perspective as more women are appointed to senior roles. “As more women take up senior roles in the drinks industry their influence will come through and will be very striking over the next 10 years,” he said. In addition, Ian Shackleton, global beverages analyst at Nomura International, said a greater number of women are most likely attracted to Bourbon rather than Scotch because of its “sweeter taste profile”. Heaven Hill caused considerable debate last month when it launched the “feminine” Raven’s Lace Peachberry Whiskey – a new brand of flavoured whiskey aimed at female consumers as an alternative to “macho” variants in the category. The expression is features an “intricate feminine lace” label design intended to appeal to a female demographic – which now makes up 40% of the flavoured whiskey consumer base. Just a few weeks later, Brown-Forman launched a “female-focused” low-abv flavoured spirit brand in the UK, called lbd. I agree with the gist of Damien’s statement. Women are as wide and varied a group as any other gender, and new expressions targeted at what somebody thinks represents the “feminine” market are probably doomed to failure. Don’t make something then try and get women to drink it. 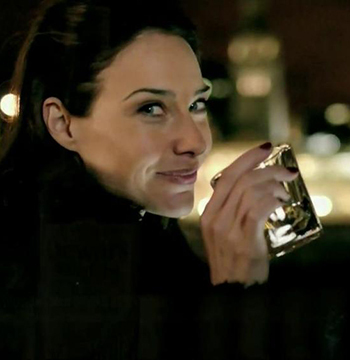 Find out what whiskies women are already drinking, then ask those women why they drink them. The answers will probably be as varied as the women themselves. Why not try making quality whiskies and let the liquid sell itself? In my experience many women prefer big, smoky whiskies, and very often when first introduced to whisky. On the other hand, very often men prefer the lighter styles on first tasting whisky. It really is a mistake to pigeon-hole based on gender.